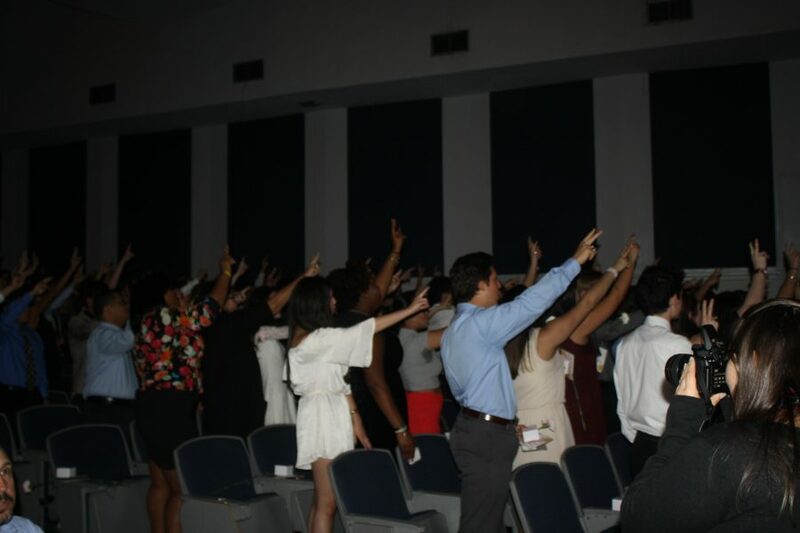 Juniors sing the Alma Mater in unison after receiving their rings, officially becoming upperclassmen. Jan. 31, 2017, Thursday at 6:30 p.m. in the auditorium, students, friends and family attended the Junior Class Ring Ceremony. Sponsored by Herff Jones, who customizes class rings and graduation products, made the whole event possible. The ceremony began with welcoming words from our junior class student council board, the National Anthem by fellow junior thespians and a speech from Harry Nerenberg, Palmetto’s college counselor, who plans to retire in 2018 along with the current juniors.The student board discussed the significance and the importance of obtaining a class ring. Juniors were instructed to follow the tradition of turning the ring 17 times and 18 times to lock it along with unboxing and placing the ring on in unison with their junior peers. This moment represented passing down a tradition that lasted generations, honoring not only students, but families. “I feel like I’ve accomplished something big for my family,” junior Chrisley Lopez said. To many receiving a ring, with prices ranging from $99 to upwards of $900, it holds momentous value. Besides all the glory, a hidden meaning remains. Others want to commemorate the joyous memories found in extracurricular activities they have participated in throughout their high school career. A junior class ring allows the wearer to reflect on the good times of the past and the future. “On my ring, I put a fotball logo because that’s the only sport that I’ve been doing throughout freshmen year through today,” junior Nykolas Calixte. The junior class ring ceremony represents the achievement of progressing through high school to friends, family and their peers. The junior class ring symbolizes the coming of age and a step toward adulthood as they share the traditions with their children and grandchildren as many did yesterday.